Do your cats come running when they hear the can opener? Mine do! The cats come running and weave between my legs, thinking they are about to receive a delicious meal. They are often disappointed to find out I am simply making dinner. Like my kids, my cats have food and plate preferences. While they won't throw a fit over the color of their bowl, they have been known to turn their nose up at certain offerings. Being a good (crazy) cat mom, I've learned which cat food flavors will be big hits. 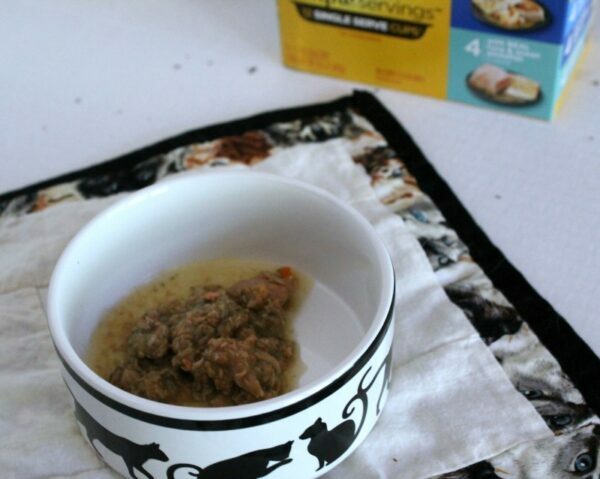 My cats think their soft wet cat food is a special treat because they have it about once a week. Unfortunately, most cans have more than either cat will eat at one meal. While grocery shopping at Meijer, the kids like to look at the fish along the back wall of the pet department. It's a great way for me to transition from grocery over to pets then to whatever department I need next. 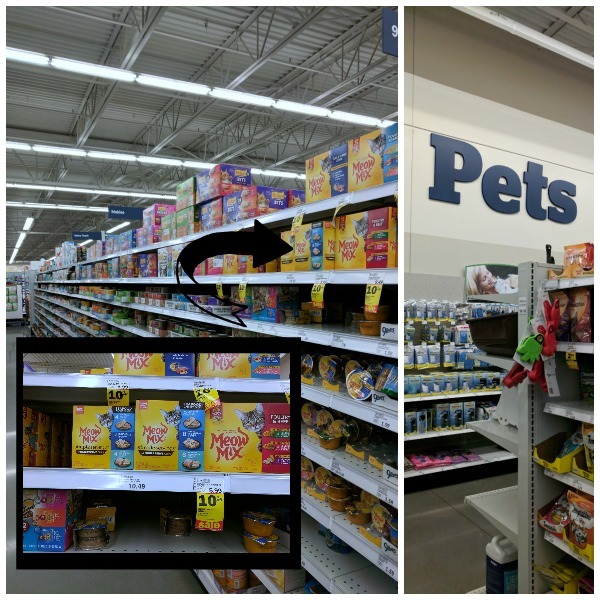 In the cat aisle, I saw the new Meow Mix Simple Servings Seafood Variety (12pk). Meijer has a 30% off mPerks offer on Simple Servings 10/08/17 through 11/04/17. Capone and Bella absolutely love seafood so I grabbed it! I also picked up a bag of catnip in order to make their DIY cat toys. As I made catnip toys, Bella watched over me the entire time. She was clearly curious, but kept her distance until I opened one of the Simple Servings containers. She rushed over, meowing. 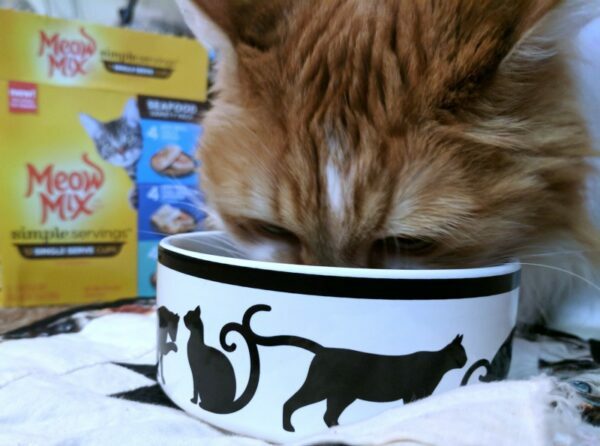 It was easy to pour into her cat bowl and was the perfect amount for her. Bella purred as she ate the delicious pieces of real seafood in a savory sauce. I opened one near Capone, letting him get a sniff before I walked out of the room. Sure enough, he followed me! After the kitties chowed down, I introduced them to the catnip toys I made. 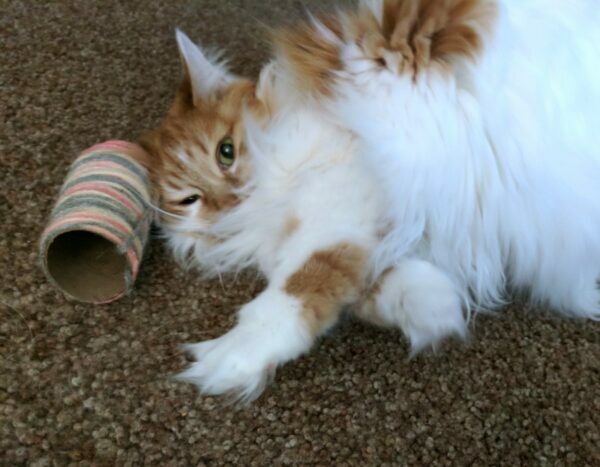 Bella kept rolling around on her back and pushing the yarn wrapped catnip paper tube with her nose. 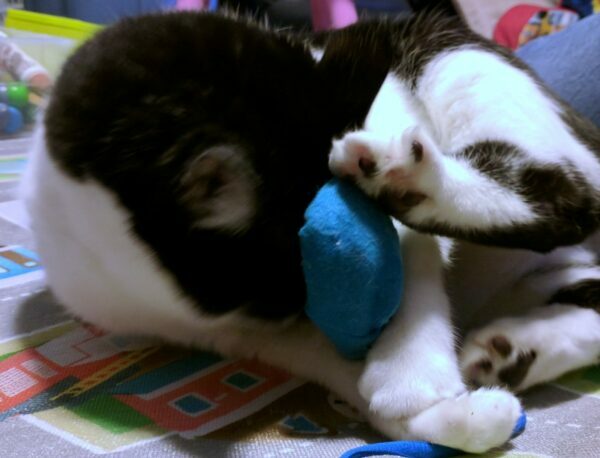 Capone clearly favored the black sock catnip toy. Start by covering your paper tube with glue, then rolled it in catnip. Essentially I decoupaged catnip to the roll. Use a little bit of tacky glue to secure yarn in place, then wrap it around the tube. Wrap it around until all of the catnip is covered up. You can glue or tie the end piece. I tied it but also kept it long enough to add a little yarn pompom to it. The cats smell the catnip, paw at the pompom, and try to stick their legs and face into the toilet paper tube. It's amusing to watch! Take an old sock and make sure it doesn't have large holes. If it does, find a different one. You don't want all of the catnip or stuffing to fall out right away. Roll sock down and add a pinch or two of catnip to the toe area of the sock. Crumple some tissue paper or newspaper and stuff inside the sock. The toy will make crinkly sounds when your cat plays with it! Either tie the sock in a knot or use yarn or a shoelace to tie it off. 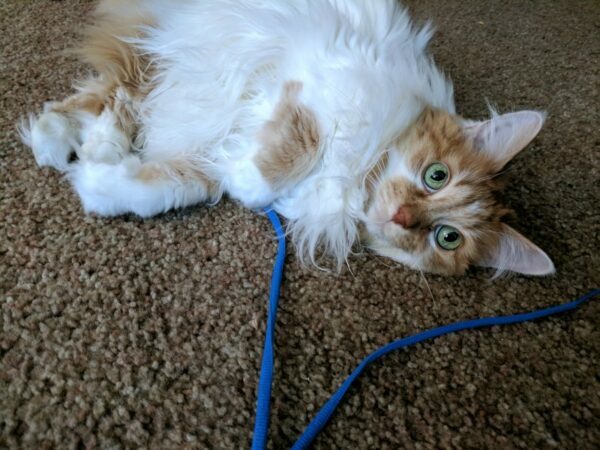 Leaving the shoelace long makes it fun to dang in front of your kitty. Roll sock down and add a pinch of catnip in the toe area. Add crinkle cut paper, tissue paper, or newspaper strips if you want. Place paper roll inside sock (works better on longer socks). Pour catnip inside paper tube. Tie the open end of the sock off with a secure knot. 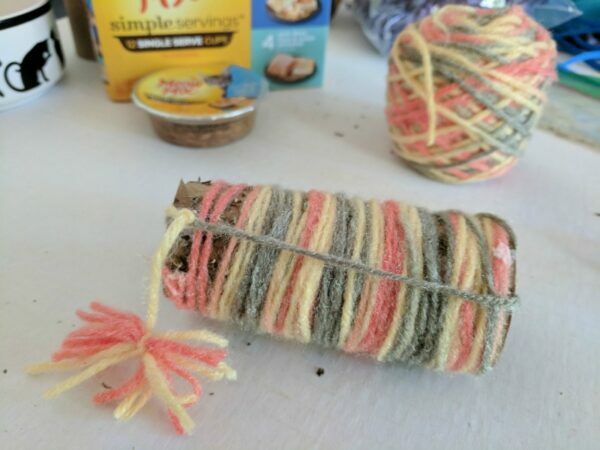 Let your cats play with these super easy homemade catnip toys! Even though my cats are getting older, they still have a playful side. Sometimes it takes a little extra effort to engage them in play, but they cannot resist catnip. No matter how old a cat is, it's important to mentally stimulate them with playtime. How do you engage your cats in play?